Lures or baits - or both. There is no doubt that different approaches will select for different fish. If you simply chuck out a paternoster baited with worms every time you go to the coast it is unlikely that you will catch anything other than the same stuff you caught yesterday, last week or last year. Of course this depends to some extent on the patterns of fish movement and migration in response to seasons, tides and weather conditions but "If the last ninety-nine fish you caught were six ounce pouting don't expect the next bite to produce a ten pound bass." To catch different species or sizes of fish you need to use different tactics. Of course this doesn't mean that you need to have a different rod, reel, line and box of rigs or lures for every trip, simply that it's worth giving a bit of thought to your methods. Bass fishing is an excellent example because bass are among the most easy going fish when it comes to food. The list of items on the bass menu is almost unlimited - all sorts of fish, squid, crabs, prawns, shrimps, worms, maggots, woodlice and lots of discarded quayside rubbish. Over the years I've seen them caught on a huge range of livebaits, deadbaits, lures and flies plus such unlikely oddments as breadcrust and dog biscuits. In view of their catholic tastes you might think that it doesn't matter how you fish for these fish but you couldn't be more wrong. I have several pals, all good anglers who, like me,fish for bass every year. Mostly we use lures and sometimes a few of us use (big fish) baits, generally free lined close in. Out of interest I've totted up the catches so far this year using the two methods and worked out how long it took us to catch a bass. I've also considered the number of hours to catch a bass of over 4lb (this is the figure I used forty years ago to compare catches). It all boils down to how many 'rod-hours' you spend flogging away to land a fish. Firstly, using lures. In the early 1980s we averaged 2.4 rod-hours per fish (bass) caught and this year so far 2.0 rod-hours per fish - about the same. With regard to decent sized fish in the 1980s we spent, on average, 6.0 rod-hours to land a fish of over 4lb on our lures but this year it has been 59.3 rod-hours per bass of this size. Quite a decline eh! How about bait fishing? Well I dont really have comparable figures because we no longer spend countless hours behind rested beach-casters as we used to. However, in the 80s the average number of rod-hours to catch a fish (this is all fish including pout, rockling, dogfish, conger, bass, pollack, etc..) was 2.1 and for a good fish it was 34 rod-hours. The corresponding figures this year (mostly freelining with big baits close in) are 4.1 rod-hours per bass of any size but only 5.8 hours per bass of 4lb+. So, about twice as long as forty years ago waiting to catch a fish, although now they are all bass. The eye opener is the time to catch a decent fish which is only a fraction of what it used to be and now they are only bass. Also, if we compare the time spent retrieving lures to catch a good bass this year (almost 60 hours of spinning) with the time spent to catch good bass on freelined baits (less than 6 hours) the difference is eye watering. To get to my recent exploits. I've had a couple of mornings and one evening on the rocks. 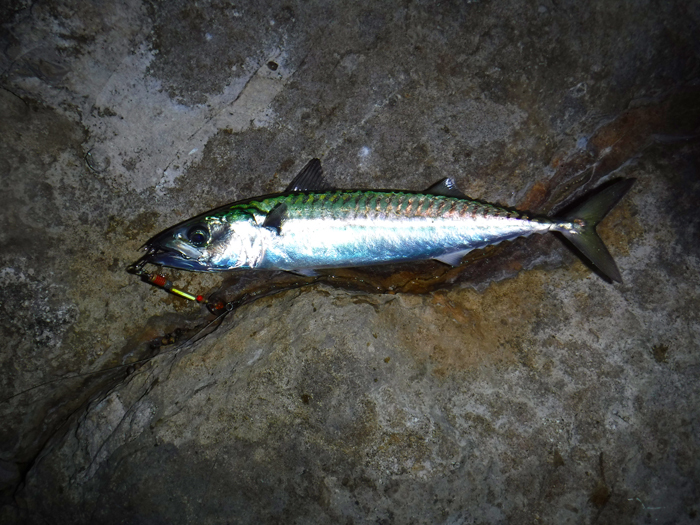 On the first morning having started fishing in the dark I hooked a mackerel on my luminous lure and immediately transferred it to the 8/0 circle hook on my other rod for free-lining. It swam round in search of a bass for almost an hour then I went home. The following morning I left the livebait rod at home and started a few minutes earlier. The scad were mad on and I was into them at once - I caught dozens and lost count. 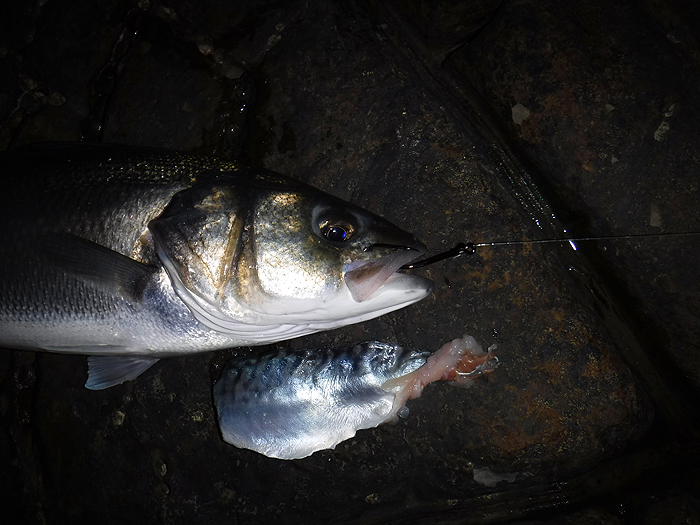 Interspersed with the scad were a couple of mackerel and two very tiny pollack. All good fun! The tide table showed that it would be the very first of the flood tide at dusk so, that evening as the shadows fell on the sea and the last of the stone throwing holiday makers buggered off I laid my mackerel fillet (same hook and gear as my livebaiting) in two inches of water and sat back on the rocks waiting for the tide to come in. The water seemed interminably slow to rise and I watched as it gradually covered each successive limpet. After three-quarters-of-an-hour my bait lay under 50cm of water and suddenly the line was twitched out of my grasp and began to run out. Faster and faster it went, barely keeping pace with my heart beat. I dropped the rod point to give a little slack and closed the bale arm the rod bowed and then straightened - it had felt some resistance and dropped the bait. I waited, hoping that it or perhaps its friend might return and for once, it did. Half-a-minute later the line began to race out again I waited and waited before once more closing the bale. The reel screeched and it was on. In the dark I couldn't see the fish but the splashes and pulls on the rod were typical of a bass. Eventually I switched on my headlamp and slid my capture ashore to have its picture taken. 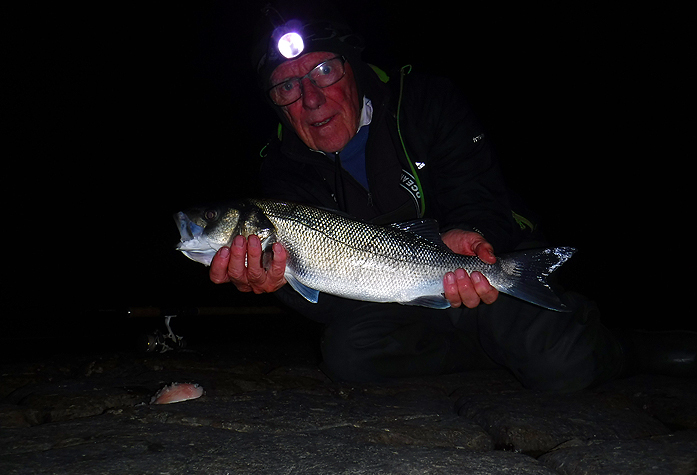 It was 59cm on my measuring tape and fat so five pounds or thereabouts and after being unhooked it swam away strongly as soon as it was back in the water. Excellent! Just to finish off this page I had a couple of interesting emails from my e-pal Alan Ó Neill over in the Emerald Isle. I shall add the pictures he sent and here's what he said. I was fishing the ebbing tide of the channel when I hooked into this 6lb fish on a live sandeel. The eel was the largest I had in my bucket which incidentally was larger than the norm due to this time of year. As soon as the fish took hold she cleared the water, letting me know what I had hooked into. Fishing for bass we would catch the occasional trout but most are not worth writing home about. I had to take my time as it was a decent fish in a decent tide. The struggle was only starting because we were drifting into the faster and much more turbulent water rushing out into the bay. A battle of all battles commenced, it took me at least 15 minutes to get the fish into the net after trying at least four times to lift the fish out before she would go on another tide aided run. The fish was finally netted and to say I was happy was an understatement. Then as we went to take the trout out from the net there was no hook to be seen. My line had passed through the seatrout's gills with the braid tangled around its sharp teeth, the remainder of the line hanging over the side of the boat with a second fish attached, a plump 3.5lb bass. A first for me in both ways. I'm not sure when the bass took the sandeel, whether it was during my fight with the trout or at the latter end, I wasn't complaining either way. How about that? Two for the price of one, I think anyone would be pleased with a seatrout like that one. 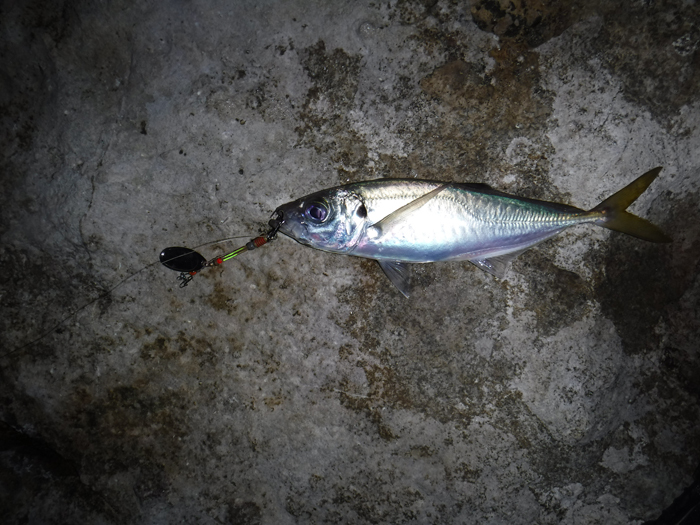 A nice mackerel (=livebait) on my Lumi-lure. One of many scad caught in the dark on the shining spinner. My bait-fished bass with the bait that caught it.- and the 8/0 still in its jaw. A selfie just before I returned the fish. 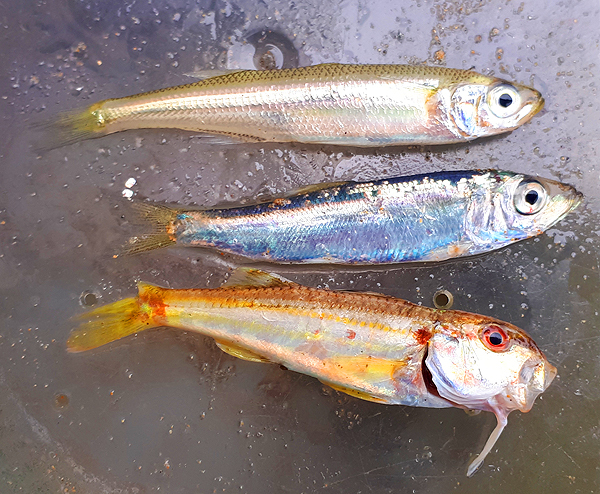 From top to bottom Alan's sandsmelt, sprat and baby red mullet. What a cracking seatrout - unfortunately no picture of the bass that was on the lure with it.